The New York Yankees introduced newly signed center fielder Jacoby Ellsbury on Friday, but the most interesting part of the press conference involved another star outfielder. When asked about lengthy contracts, specifically the 10-year deal that former New York second baseman Robinson Cano recently signed with the Seattle Mariners, Yankees president Randy Levine told reporters why he’s hesitant to make a decade-long commitment to certain players. Levine should have stopped there, because now he could be in trouble for mentioning one player he’d have no problem offering a 10-year deal. "Now, if it was Mike Trout, I’d offer him a 10-year contract,"Levine said, per Wallace Matthews of ESPNNewYork.com. "But for people over 30, I don’t believe it makes sense." According to Bill Shaikin of the Los Angeles Times, Major League Baseball is investigating the Yankees for possible tampering as a result of Levine’s comments on Trout, who won’t be eligible to hit the free-agent market until after the 2017 season. Teams are not allowed to talk about opposing players in regard to possible free-agent contracts, and in a statement released Friday, Levine apologized and said he was just using Trout as an example, nothing more. 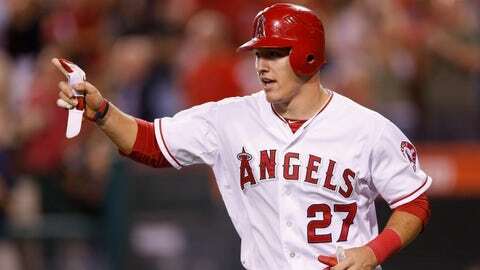 Trout, 22, is the best young player in baseball and has finished second in American League MVP voting for two straight seasons. The New Jersey native batted .323 with 27 home runs, 97 RBI, a .432 on-base percentage and a league-leading 10.4 WAR (wins above replacement) in 157 games for the Angels last season.